This easy barbecue lamb recipe with mint marinade for is just the ticket for tenderising the lamb and imparting a light fresh flavour. The marinade really does it's job in an hour, no more. And the best bit about this recipe? - It's so easy! Lamb and mint is a very traditional combination yet no one really knows how it came about. Some say it harks back to the days when mutton was on the table rather than lamb and the argument concludes that the mint sauce was there to disguise the strong flavour of the mutton which was not best liked. The sharp acidity of mint sauce is more down to the vinegar content than the mint. Lamb (under 12 months old) is still a strong flavoured meat, so is hogget (1 year old) and so is mutton (2 year old sheep) and I think too many people turn their nose up at mutton without even trying it because they've read somewhere that it doesn't taste nice. It tastes lovely to me so the argument that mint sauce was used to cover the taste of mutton has to be a load of tosh. Okay, I'll get off my soapbox, let's just agree that lamb and mint goes well together whatever the history and get back to this barbecue lamb recipe with mint marinade. I'm using lamb leg steaks in this recipe (one of my absolute favourite cuts) although you could just as easily do it with chops. To be fair the leg steaks are more expensive but there's no bones so pound for pound it doesn't make too much difference. I've chosen to serve this dish with boiled new potatoes and my fire roasted red pepper salad. 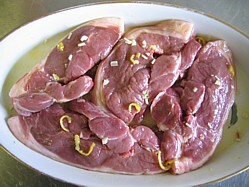 Mix up all the marinade ingredients in a shallow dish, throw in the lamb steaks, cover and leave to marinate for an hour. The olive oil and lemon juice will do a great job of adding flavor and tenderizing the meat. Because this barbecue lamb recipe with mint marinade makes the meat so tender you can afford to cook the steaks for less time so that they remain pink in the middle. If you are going to do it this way you need to ensure that despite the meat being pink it is still warmed through and the best way to ensure that this happens is to make sure that your lamb is at room temperature before you put it on the grill. For that reason I always recommend that you take the lamb (still in its marinade) out of the refrigerator about 2 hours prior to grilling. When you come to do this you may find that the marinade has gone cloudy, don't worry this is just down to the longer chain fats and waxes (that are naturally present) in the oil solidifying. As soon as it starts to come back up to room temperature it will return to its normal translucent liquid state. At this stage you can boil the new potatoes and set the red peppers on the grill to char - see the full fire roasted red pepper salad recipe. 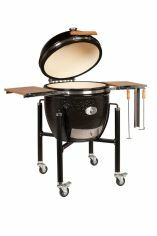 Get the barbecue coals good and hot. 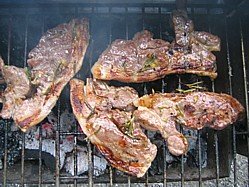 Season the lamb well with salt and freshly ground black pepper and slap it on the BBQ for about 8 - 12 minutes depending on how you like it. (8 minutes for pink, 12 if you prefer it more well done). Turn once at the half way stage using tongs. When done, remove the lamb steaks from the heat and allow to rest for 5 to 10 minutes, then plate up and serve. If this barbecue lamb recipe with mint marinade has given you a taste for more marinades then check out my whole section dedicated to barbecue marinades.